You're not the first homeowner who has surveyed the living room or family room on the morning after a social gathering to discover spots where guests have sloshed beer or wine into the carpet. Wine is often the more difficult stain, but both beer and wine are easier to remove when they are still wet; dried stains take more effort. Therefore, try to soak up the spilled liquid as soon as possible, then attack the stain with household cleaners or an effective stain remover product. Immediately blot up the liquid from fresh stains using a white cloth or paper towels, and take pains to get up as much of the liquid as you can. Be sure to blot the area rather than rub it, which just spreads the stain and works it deeper into the carpet fibers. Beer is often a sufficiently light color to blend in with most carpets. But just because you don't see the stain doesn't mean it's not there. Make the effort to remove the stain completely to prevent the stain from attracting dirt and possibly returning over time. Blotted up as much of the spilled liquid as possible. Mix a solution of 1/3 cup white vinegar and 2/3 cup plain water. Pour the solution into a clean spray bottle. Spray the solution onto the stained area once or twice, then blot up the solution using paper towels or a white cloth. Repeat the process until all the solution has been used up and all moisture has been blotted up. Add a few drops of plain, unscented, dish soap to 1 cup of warm water. Mix this thoroughly, and then dribble a small amount onto the stained area. Using a clean white rag, dab at the moistened area until it is dry, then repeat. Continue to do this until all of the detergent solution has been used up. Apply a small amount of warm, plain tap water to the area and dab it dry. Smell the carpet. If you can smell beer, sprinkle a little bit of carpet-freshening powder or baking soda over the stain, and let it dry. You can run a fans to speed the drying. Once it is completely dry, use a vacuum to remove the carpet powder. The darker the wine and the lighter the color of the carpet, the more difficult it will be to get a stain out. Attack the stain as soon as possible for the best results. 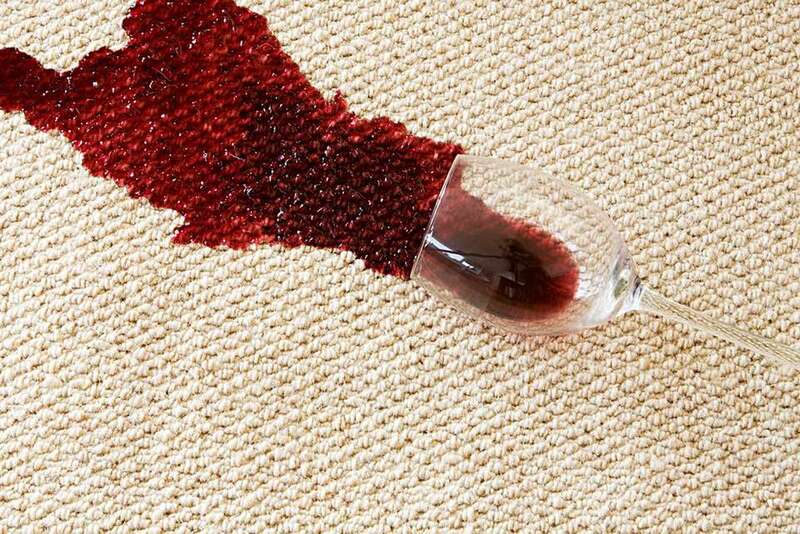 Removing a set-in wine stain from a carpet will require a three-part process. Mix 6 ounces of clean water with 3 ounces of vinegar. Pour the mixture into a clean spray bottle. Apply a few squirts of the mixture to the stained area. Let it sit for a few moments, then dab it up using a white cloth or paper towel. Continue to spray and dab the stain until you no longer see color coming up from the carpet onto your cloth. In some cases, it may be necessary to mix up a second batch of vinegar solution. Warm a cup of water in the microwave for about 30 seconds. Add five drops of unscented dish soap and mix the solution thoroughly. Dribble or spray the soap mixture onto the stain, then use a rag or sponge to work the solution gently into the carpet. The goal is to loosen the staining agent without spreading the stain to surrounding fibers. Blot up any excess moisture with a dry cloth or paper towel. Repeat the same process until the entire soap solution has been used on the stain. Rinse the carpet thoroughly by dribbling clean, warm water onto the area and blotting it with a cloth or paper towel until dry. Repeat this process several times until you are certain that all of the vinegar and soap (from the earlier steps) are gone. Smell the area to make sure it is clean. Dry the carpet with a fan. This will rapid-dry the carpet, preventing dye stains from rising to the surface. You can repeat the standard stain-removal steps as many times as you want, but in some cases, red wine stains will be particularly difficult to remove from a carpet. When this happens, you may want to try using 3-percent hydrogen peroxide on the affected area. Always test hydrogen peroxide in an inconspicuous area to make sure it doesn't bleach the carpet before using it on the stain. Apply the peroxide to a cloth or towel and dab it gently onto stain. Allow it to sit on the carpet for one to two hours. Rinse the area with clean water and blot with a cloth to remove the peroxide from the carpet. Rapid-dry the carpet with a fan. Although most stains can be removed with household cleaning solutions, if stains remain after a standard treatment, you can reach for one of a few types of commercial stain removers. Oxygen cleaners, such as OxyClean, is a popular name for a group of cleaners based on hydrogen peroxide. In addition to hydrogen peroxide, OxyClean contains sodium percarbonate as an active ingredient. Like pure hydrogen peroxide, OxyClean works by essentially "bleaching" the wine or beer stains so it no longer has color. Be careful to test carpet fibers for color-fastness before using this or similar products. Another popular class of modern cleaners are those that work by means of enzymes that dissolve organic material, especially proteins. Products specifically made for cleaning alcoholic beverage stains include Wine Off and Wine Away. Wine Away uses methylcyclohexane, an organic solvent, as its active ingredient. Wine Off describes its active ingredients as "friendly bacteria and enzymes," but all products in this class of cleaner work in the same way—by breaking down organic material. They are often touted as the best way to eliminate pet urine stains but will also work on other organic stains. Propylene glycol methyl ether is an active ingredient used in products such as Resolve and similar stain removers. These products are true liquid solvents that chemically bond with the staining agent in the carpet. The solvent must then be blotted up to remove it from the carpet. These are unpleasant-smelling products that use harsh chemicals, and for some homeowners, they will be a last resort.